Please refer to our stock # 3332 when inquiring. Chanan Mazal, Blessing for the Sabbath Candles, Original Illumination, 1997. Frame size 18 1/4" x 14 3/4", Illumination 12" x 8 1/2". Illuminated manuscript, handwritten book that has been decorated with gold or silver, brilliant colors, or elaborate designs or miniature pictures. Though various Islamic societies also practiced this art, Europe had the longest and probably the most highly developed tradition of illuminating manuscripts. 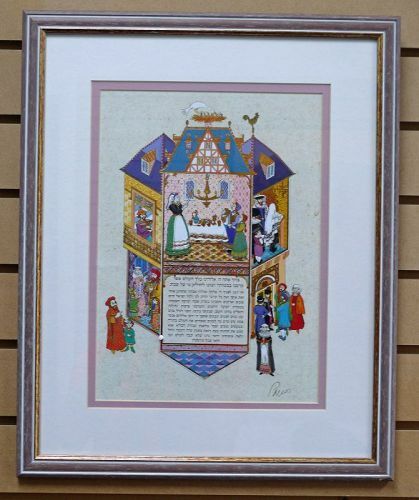 This illumination is set in Germany and reflects the history of that unique Jewish community. In the different rooms are depicted the Sabbath's ceremonies performed by characters in authentic historical costumes. The large woman lighting the Judenstern, Sabbath lamp, wears an Oralles, blue striped veil, as mandated as a sign of degradation by Gentile authorities in the 17th Century. Men in the synagogue to the right, war 18th & 19th Century Sabbath attire. Cloks had openings only for the left arm as a reminder of prohibition of carrying out-doors on the day of rest. Man reciting Kiddush in the upper left window wears peculiar medieval Judenhut, Jews' hat. Below him a 16th Century family performs Havdala Sabbath conclusion ceremony. Yellow circle worn on chest is Jew's badge which was enforced from 1434 til the late 1700s. The Nazi reintroduced it, shaped as a Star of David.